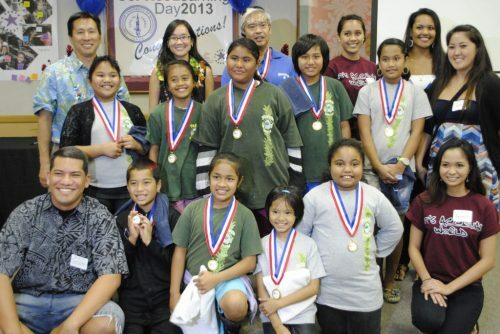 Some Pālolo Stock Market Game participants with Chaminade University’s Service-Learning students. One day, you might be helping a fourth grader with her math homework. The next day, that fourth grader may be making “one meeeeeeelion dollars.” How are our neighborhood keiki learning to bring in the bacon? Since 2010, Chaminade University’s service-learning students have been involved in the Stock Market Game as an after-school project with Pālolo Elementary School. Pālolo fourth and fifth graders create teams with Chaminade students and together they learn to make critical investment decisions through healthy competition. A key player in the project is Chaminade Professor Wayne Tanna, who facilitates learning for everyone involved. The Stock Market Game is an online educational activity for students; it has engaged more than 12 million children in grades four to twelve nationwide since 1977. Students start with $100,000.00 in virtual dollars, but they use real-world research on real-world companies to try to create a top-performing portfolio for their virtual stock investments. The program was created to promote socially responsible investing, as well as integrity and leadership. Through what they think is a game, kids learn math, economics, business, language arts and social studies. The Chaminade-Pālolo connection was a huge success this past fall. Led by Professor Tanna, Chaminade students applied their knowledge of business ethics and analysis, accounting, research, and financial statements. Together, they led the Pālolo kids to earn two of the top three awards in this national competition, for the Hawaiʻi district. Thirteen students will receive medals and ribbons* presented in an award ceremony at Chaminade’s Service-Learning Day celebration this March. * The main sponsor of the SMG program is the SIFMA Foundation. The Foundation is dedicated to providing knowledge and understanding of financial markets across communities. Through various opportunities and tools provided The SIFMA Foundation educates individuals about the benefits of the global marketplace.